Another recent purchase via Pencils.com the Stabilo GreenGraph is yet another good looking pencil. We can talk about my love of olive drab green and how it might skew my review of this pencil’s good looks. Or not. This pencil features a flat olive green paint and cream colored pin stripes and imprint. The pairing of colors is very nice, and as I’ve stated previously easy on the eyes. The reverse side has a bar code printed in white. It’s not obtrusive. 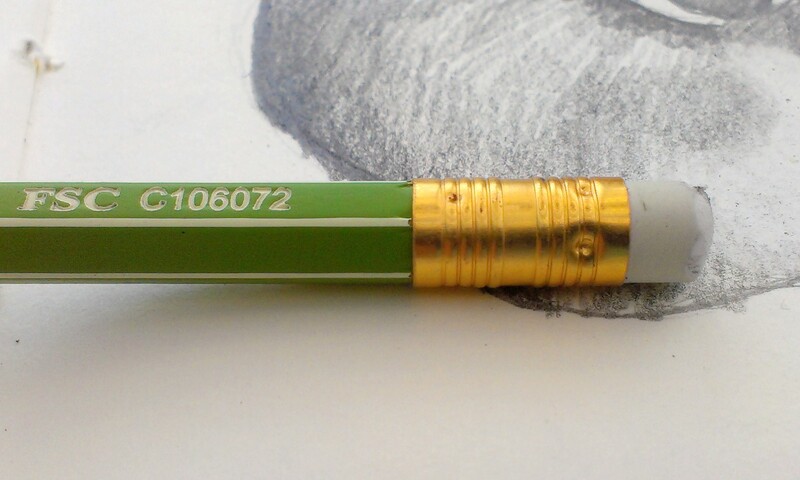 The ferrule is brass colored and tightly fixed to the body of the pencil. It holds a super firm white eraser. The flat paint of this pencil feels strange at first but through use it isn’t slippery even when moist. (I tested this out by picking up my iced coffee, getting my hand wet with condensation then continuing my writing.) The wood is soft and fragrant but I don’t think it’s cedar. The pencil is FSC certified. The average sized core is well centered. It sharpens with ease in any of my sharpeners. It holds a point nicely. In terms of darkness Iid rate this more as a B or 2B grade than HB. 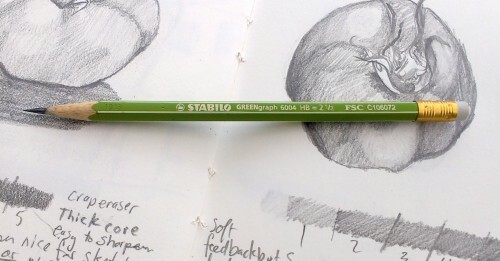 In use this pencil is very dark, smooth with feedback from the graphite. 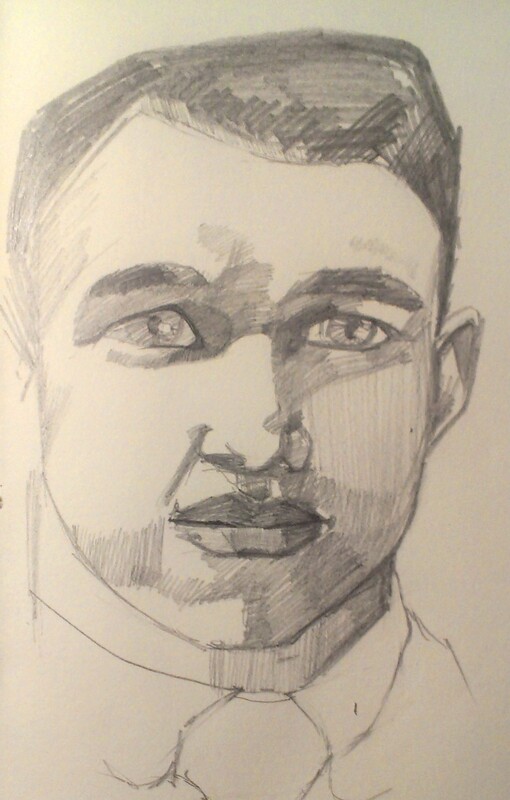 Some pencils, like the Staedtler Rally and this are smooth but have what I call feedback in the graphite. this means that rather than feeling like skating across paper like a Blackwing it’s more like driving a dirt bike through sand. The feeling isn’t drag per se but more subtle. With a fountain pen this would be called feedback. This is a pencil that if you like feedback from your pen and paper combination you’ll get it. 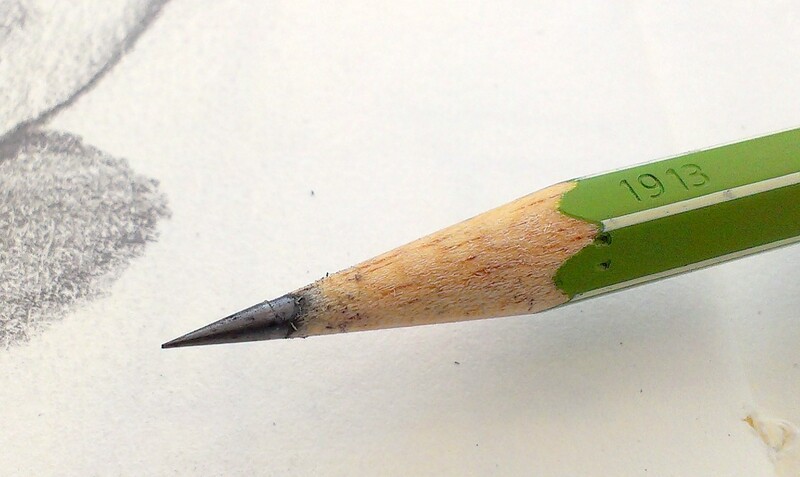 This is a pencil for people who don’t like the feeling of the Blackwings. I digress, the pencil is nicely dark both in writing and in sketching. It layers up to dark nicely it is hard enough that lighter shades are possible as well. 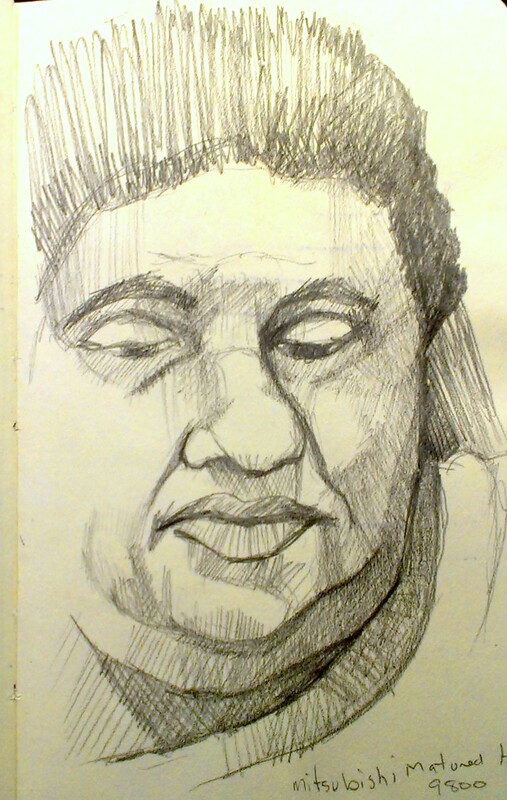 It was really fantastic for sketching. I also really enjoyed it while writing. I used it for a brainstorming session for internship group art therapy ideas and really enjoyed the writing experience. I also used it while reading a textbook for underlining the pulpy paperback. It worked well. The super firm white eraser worked really well. It is one of the best erasers I’ve gotten on a pencil in a long time. 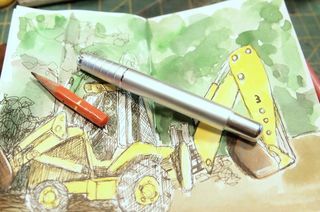 I was able to use it while sketching and for cleaning the written word off composition book paper. Though I’ve used it repeatedly the ferrule and eraser are still fixed firmly to the pencil. 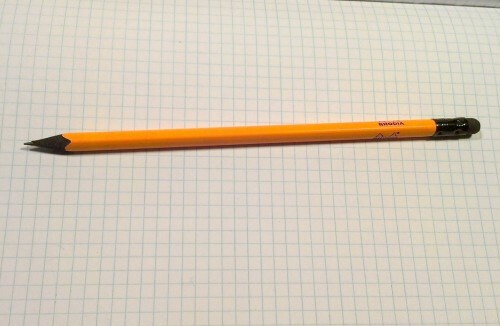 In terms of value, this pencil when purchased in a 3-pack via pencils.com is around $1 per pencil. 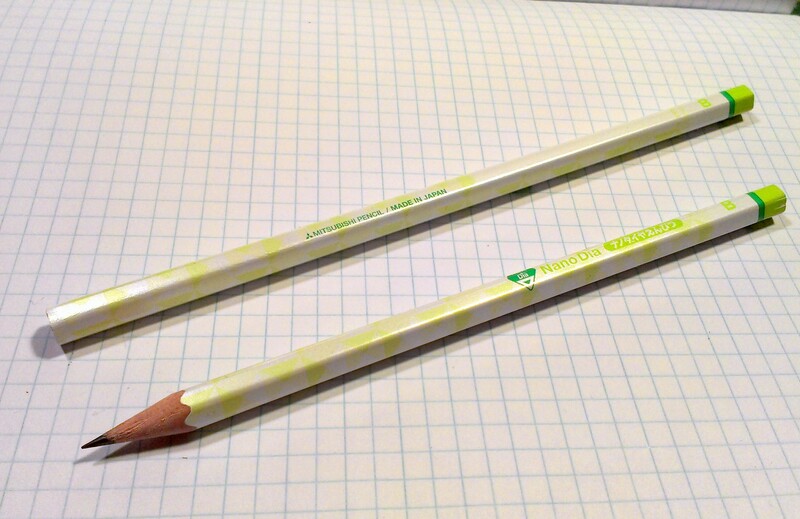 When purchased in a 12-pack the value is better at 83 cents per pencil. This puts them into the affordable but not cheap category for me. I like them enough that I wish I’d bought he 12-pack rather than the 2-pack. Pencils.com is the only place to get the at a reasonable price. I cannot find them on ebay and the price on Amazon was about $30 for 12!!! 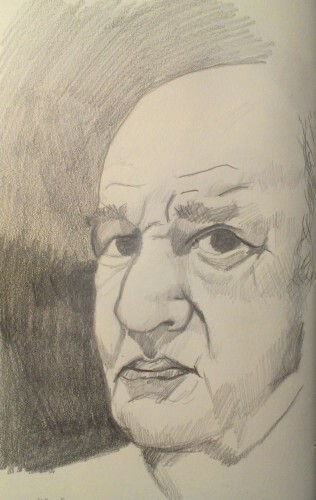 This entry was posted in Review and tagged HB, pencil, pencils.com, review, Stabilo. GREENgraph on 20140925 by leslie. 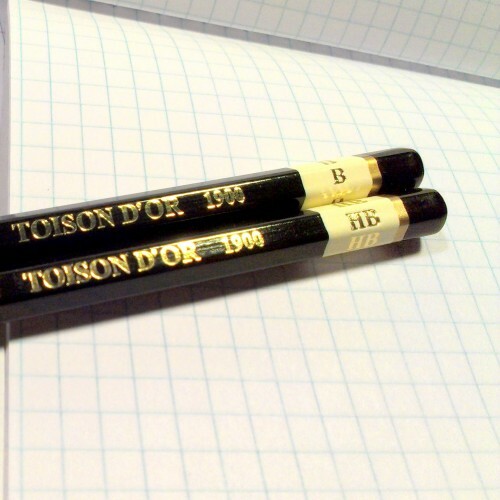 The Koh-I-Nor Toison D’ Or pencil is sharp looking with shiny black and cream lacquer and a gold imprint of the name and degree indication. I have a thing for black pencils, probably because they were hard to find when I was a kid. The gold foil imprint is sharp and well centered on the barrel of the pencil. I’m unsure of what kind of wood this pencil is made of, but it sharpens easily in my KUM ellipse sharpener. The core is narrow on the HB and B but it is appropriate for these grades. In use I found the “lead” to be a grade or two harder than other brand’s grade designations. 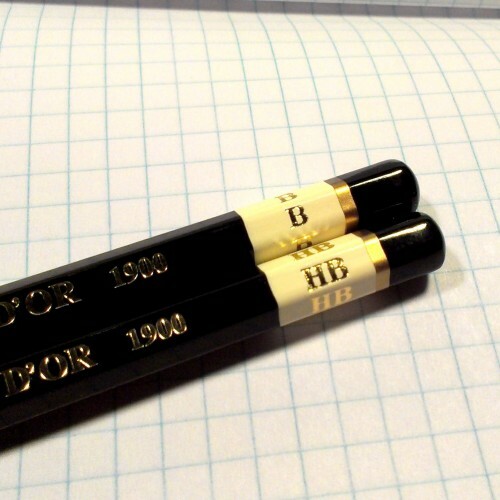 I would grade the HB as an H or F in any other brand of pencils. The B would be an HB in other brands. 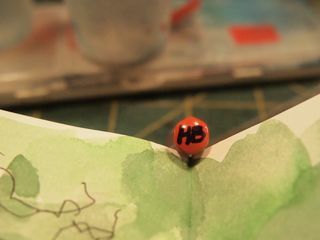 The HB pencil was very hard and scratchy. In fact, there was a piece of grit that didn’t write when I turned the pencils to that part of the point. Quite annoying. After sharpening the pencil there was less grit but it was still very light and smooth but occasionally gritty. The B pencil was much smoother and the darkness and softness akin to an HB pencil. The core lacks the smoothness of say, a Palomino or even a Dixon Ticonderoga. 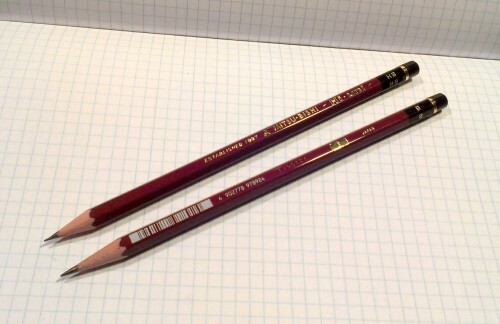 If I were to use these pencils for writing, sketching or drawing I’d stick with this grade. This pencil was quite nice and even after repeated sharpening I didn’t hit any large pieces of grit like the HB pencil. I found these to be a mixed bag in terms of niceness versus frustration. 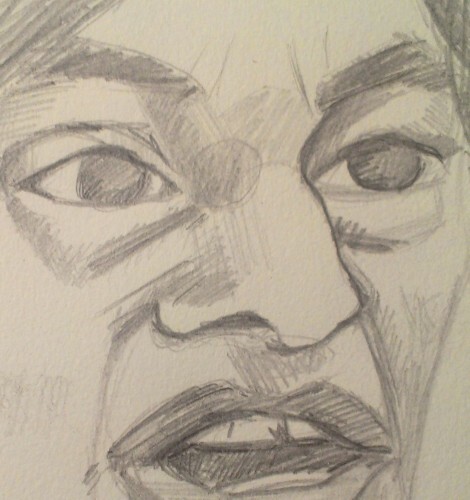 Large pieces of grit are something I don’t have a lot of tolerance for in my pencils. With a list price of $1.79/pencil I found the price to be a little high for the quality. For general sketching pencils I find the Staedtler Rally or Norica to be a better HB pencil at a much better price. Still lower in price the Palomino HB is a much better pencil. I know these are available all over the place as an art pencil and positioned as a value pencil. I can’t really recommend them as a good option for writing or sketching. Use them if you’ve got ’em but I wouldn’t suggest them as a new purchase. This entry was posted in Review and tagged koh-i-nor, pencil, review, toison d'or on 20140717 by leslie. 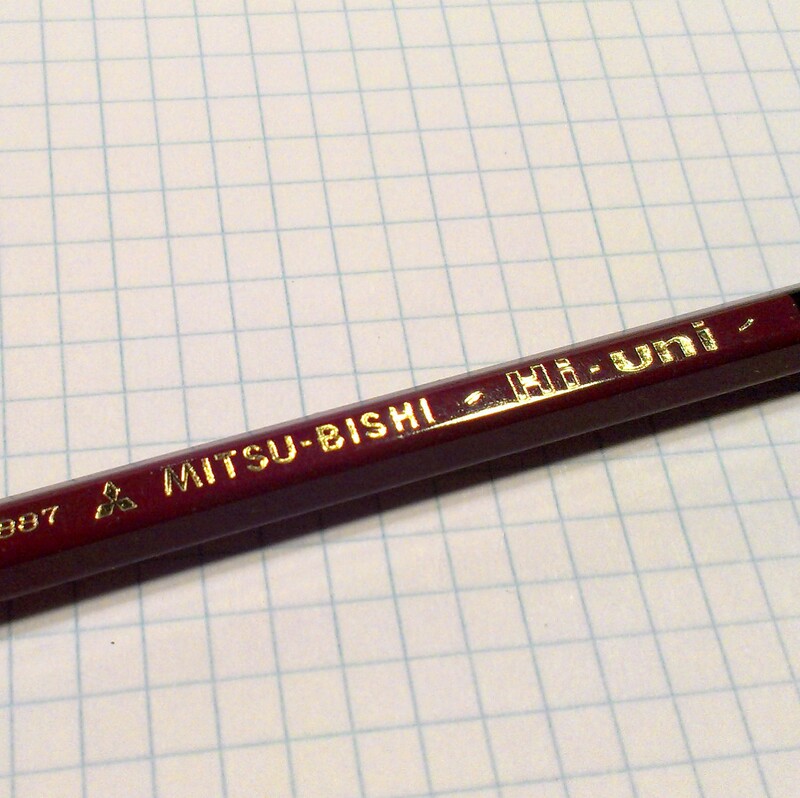 Another JetPens purchase was a Mitsu-Bishi 9800 HB “general writing” pencil. At a rich price of 70 cents this was the least expensive pencil of my recent purchase. And at 70 cents it was the best value. 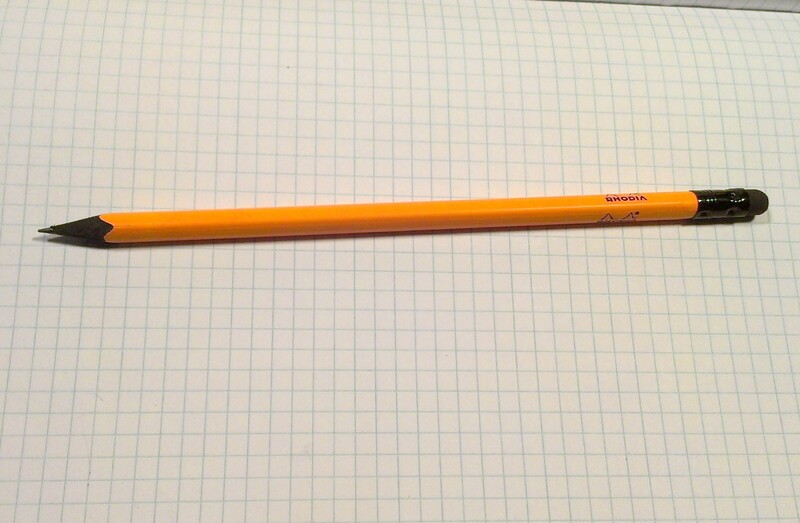 from what I’ve read the core of this pencil is the same as the Hi- Uni. In use, this HB pencil proved to be just as smooth and dark, at a fraction of the price. The core is well centered in the wood, which you can view at either end, as the “ferrule” end is unfinished, leaving the wood and core visible. I cannot smell if it is cedar or not, but my allergies may be blocking the scent. The wood sharpens easily in my KUM Ellipse sharpener. The pencil boasts that it is “matured.” According to the info on JetPens that is in reference to the graphite core being matured. I assume this has to do with the process of creating the core, perhaps a drying process. Whatever the process it has lead to a strong and smooth core. The graphite core in this pencil holds a point well and is nicely dark. It allows for a range of tone in it’s use, but doesn’t need to be sharpened every minute or two. 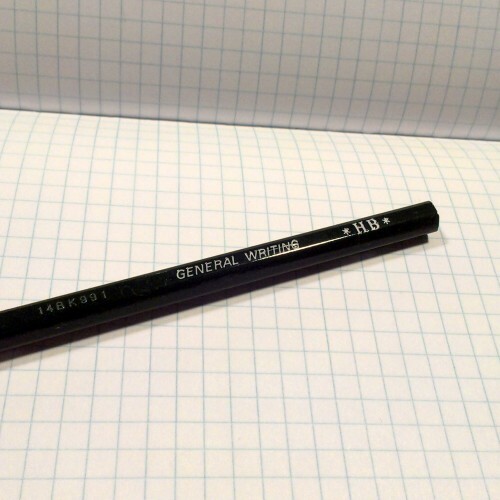 It’s perfect for general note taking or sketching. Even though it’s an HB it does give a nice enough range of tone. 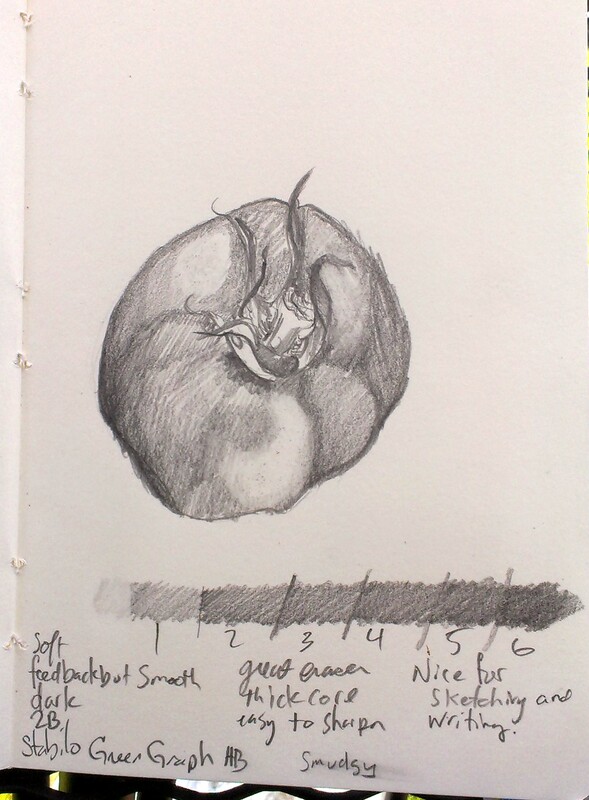 For more finished work a few more grades of pencil would be needed to give those deep dark areas a good drawing needs. These are available from 2H to 2B. It’s a good range for sketching but for deeper darks you’ll need a 4B or 6B or softer from another brand. The HB is perfectly suited for writing as well. 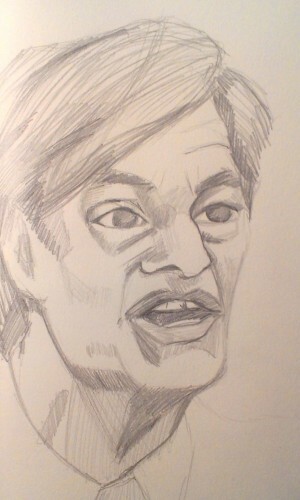 It’s a nice dark pencil. It’s a great pencil at a great price, 70 cents is not a bad price for any art pencil, and when you start to get into “higher’ end pencils, finding a nice one under $1 each is a good deal. It’s not the best looking of my recent purchases, but it’ s a darn nice pencil. This entry was posted in Review and tagged 9800, matured, mitsu-bishi, pencil, review, uni on 20140710 by leslie. My high school’s arch rival’s school colors were orange and black. I later taught at the rival high school and on spirit day I wore my letter jacket… from my old school. Good fun. 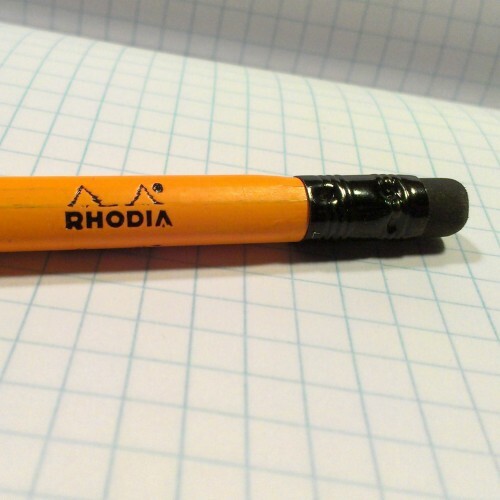 If that school could have a pencil mascot it would be the Rhodia pencil. * This triangular pencil boasts a snazzy bright, nearly fluorescent, orange body with a sharply painted black ferrule. It’s fitted well to the pencil. The eraser, also black, is round, and is secured to the ferrule with 6 divots pressed into the ferrule. It’s overkill and finishes the otherwise beautiful pencil off roughly. But it can’t all be perfect. Inside the pencil is wood that is dyed black. From what I can find, it is not made of cedar. According to PencilRevolution, it’s linden wood. Whatever it is made of, it sharpens with ease and quickly in my KUM Ellipse sharpener. 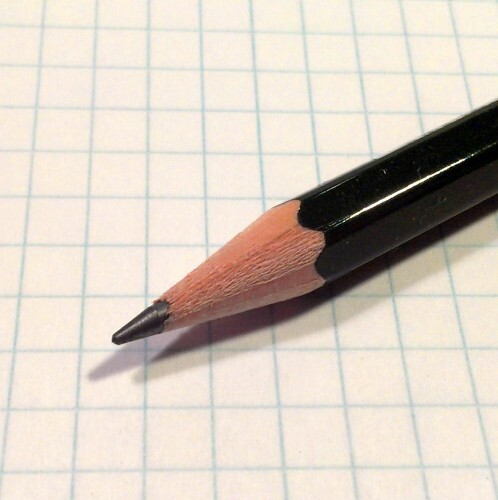 With both the included eraser and a stick eraser the pencil erased cleanly from paper. Leaving behind a slight trace of the word removed. The included eraser is gritty but not gritty enough to damage paper with general erasing, though, I suspect repeated erasures would leave a hole in more delicate papers. 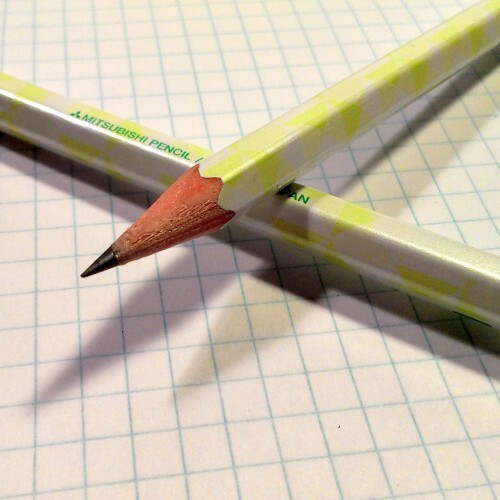 The triangular shape of the pencil was comfortable to hold and doesn’t roll off my table or desk. This is a very good looking pencil that is gritty in performance. If you favor smooth pencils like the Palomino Blackwing series, you might not like this pencil much. But, it is a good pencil to try out. It’s available from Jetpens as a single only (great for an add-on item to get your order to $25 for free shipping.) but is available in other places by the dozen or at Bob Slate in Cambridge, MA. 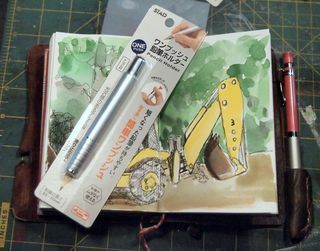 This entry was posted in Review and tagged jetpens, pencil, review, rhodia on 20140703 by leslie. The shining star of my recent Jetpens purchase is the MitsuBishi (UniBall) Nano Dia pencil with a B core, in green and white. They are available in 2B as well and in the following shades green, pink and blue. 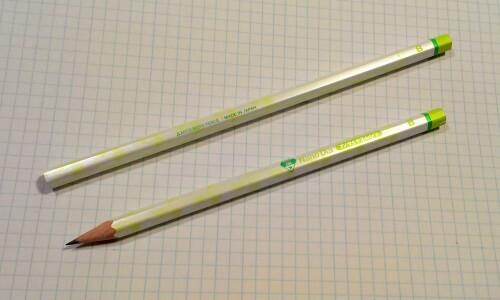 The white finish of the pencil is pearlized. It’s very similar to the pearlized finish of the Palomino Blackwing Pearl. Howeve,r the NanoDia has green triangles printed over the creamy white finish. They are semi transparent and barely noticeable. There are 2 accents of a darker bright green. 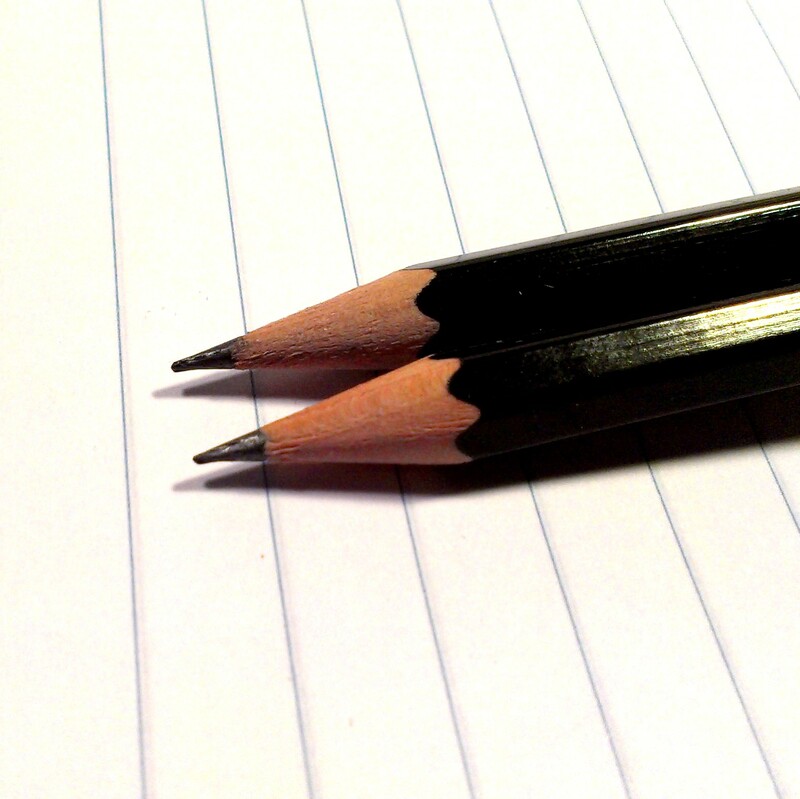 One is a diamond shape and the last is a band at the ferrule end of the pencil. Together the colors work well and make for a very nice looking pencil. The green reminds me of the Staedtler Wopex coloring. The ferrule end of the pencil is not finished. 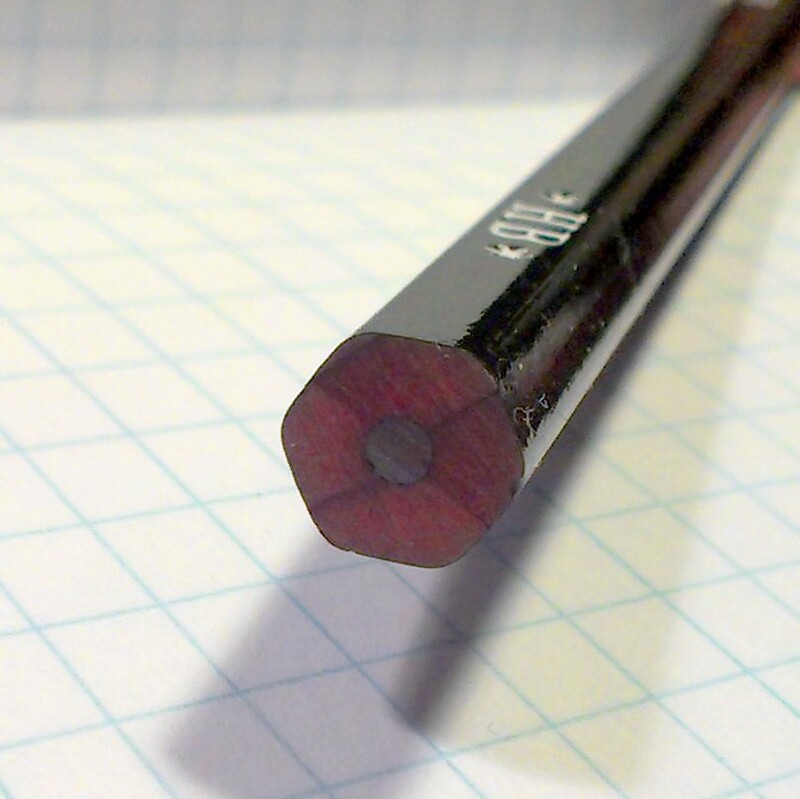 The core and the wood of the pencil are visible. the core is well centered. The pencil sharpened to a nice point in my Kum Ellipse sharpener. Because my allergies are interfering I cannot tell if this is cedar or not, however it LOOKS like cedar and sharpened well. 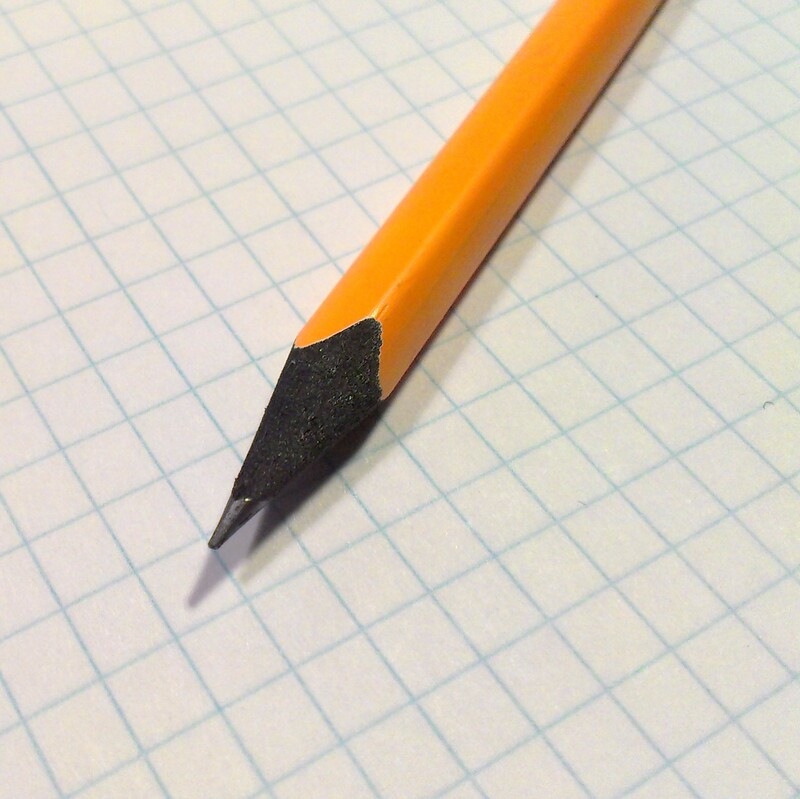 The pencil is graded as a B, and it writes like a B pencil. It’s darker than most HB pencils and is softer and smoother. However, it held it’s point well and didn’t need to be sharpened after every word or scribble. It erased cleanly with both block and stick erasers. 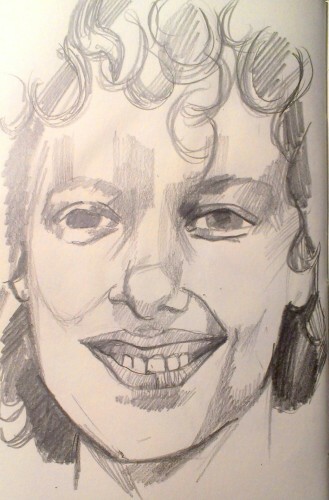 It is be well suited to sketching or note taking. If I were to compare this to a Blackwing, I’d say it’s VERY similar to the Blackwing Pearl in darkness and softness of the core. Also, it is affordable priced, arriving in a 3-pack for $3. This is again, an option to boost your JetPens purchase to being over $25 to get you to free shipping. Don’t like green? You can get it in bright blue or pink. All colors are available in B or 2B. The green is a great spring color. Final word? A good looking and affordable pencil that will make you happy. I’ll be reaching for this one more than any of the others I ordered in this Jetpens package. I would say if you want the Blackwing experience with a lower cost, the B NanoDia will give you that experience. I’d rate this at a very similar level as the Blackwing Pearl. If you don’t like wood cased pencils, Uni offers the lead for mechanical pencils. It’s as nice as what is in the wood pencils but offered in more of a range of hard and soft. I have a couple of packs and I’ve been happy with them. 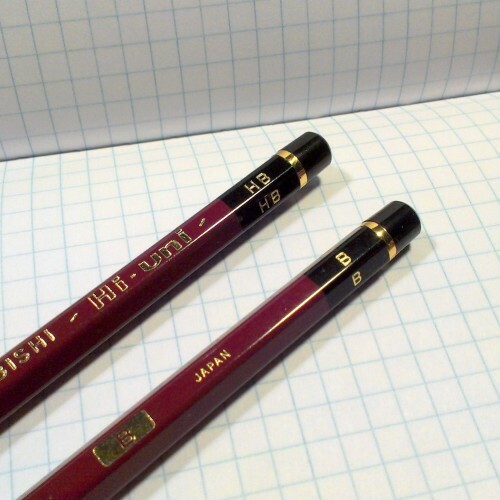 This entry was posted in Review and tagged jetpens, misu-bishi, naodia, review, uni on 20140619 by leslie. I'm a huge fan of watercolor crayons I've tried a number of brands but keep coming back to Caran D'Ache. Why? They are creamy, loaded with pigment, and move with water excellently. They are however pretty pricey at just over $1 a crayon that can add up. 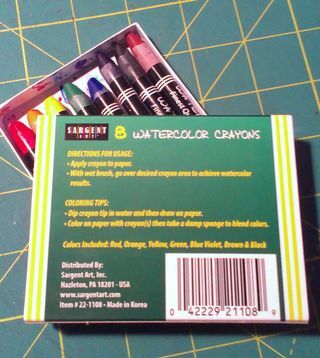 When I saw the Sargent Watercolor Crayons I wanted a pack immediately. I couldn't decide between the 8 or the 12 pack. Eventually I went with the 8 pack. They were reasonably priced at $6.67* at Artist & Craftsman. They are in a cardboard matchbox sliding box. No fancy tin here. You'll haveto excuse the paint that I got on the box, I had to use them to review them, and that included doing some of my usual watercolor crayon techniques. The crayons themselves at first are a little stiff, I think the outer layer of crayon has dried out a tad. 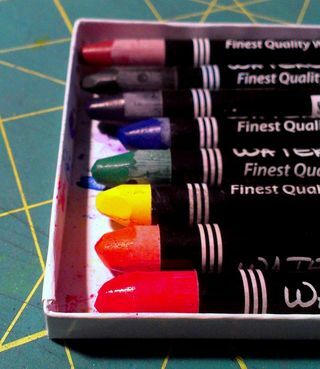 Once I used them for a few minutes and wore off the outer layer these crayons perform really well. I was really really surprised at how well they performed for inexpensive watercolor crayons. After the initial dried layer the crayons goes onto the page smoothly and looks like any crayon. The color is nice and deep so long as you put enough crayon on the page. The darkness of color can be controlled by how much crayon you lay down on the page. Color lightly- get light color; color heavily and get dark color. These really surprised me in how well they lifted and moved around with water and a brush. They really needed very little water and brushing to move around well and blend with one another. Really really impressed with their ability to move once wet. 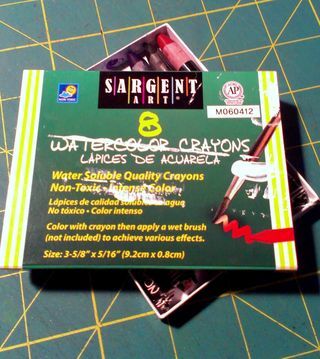 Unlike the Staedtler watercolor crayons these moved while wet like Caran D'Ache. I'm very impressed with this realtive newcomer to the watercolor crayon market. 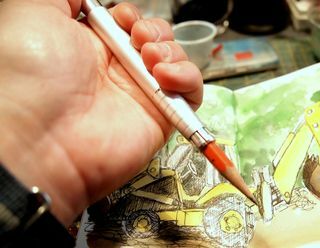 They perform really well for any art journaling need and are signifcantly less expensive than the Caran D'Ache. Are these archival and lightfast? Probably not. I've not yet tested them. But like any student watercolor it's not likely. They do match the Sargent Watercolor magic liquid watercolors. So color-wise they match, allowing easy mixing across materials. While I didn't purchase the 12-pack with a "free" brush I did look at the brush, flopping around loose in the cardboard box… It didn't look like it was a very high quality brush, but it would be useful for washes. It certainly looked like whatever point may have been on the brush was long gone. I don't know why manufacturers that include a "free" brush in a box of something haven't learned to put a small dab of rubbery glue to hold the brush in place to prevent damage. Common sense might cost the manufacturer some money. A new addition to my review will be looking at the material's potential for use in my future art therapy practice, I'll keep it at the bottom of my reviews so people who aren't interested can ignore it, and those who are can find it easily. 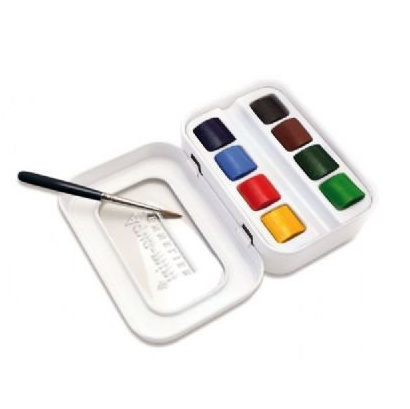 These watercolor crayons could be used with children or adults with success. They work as well as the "big" brand but at a much lower cost. Meaning, they can be purchased in a plentiful quantity that the client will never feel they are running out of materials and lending a sense of freedom to their use. 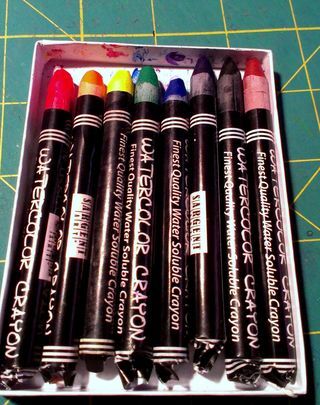 If giving a client a new box is important, that can be done because the cost of these crayons is low. The crayons are non-toxic. There is, of course, the typical concern that one might have when giving "children's" supplies to adults. This entry was posted in Review and tagged art, art therapy, caran d'ache, compare, crayon, expressive therapy, journal, review, sargent, therapy, watercolor on 20131010 by leslie. 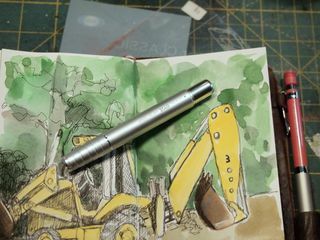 I picked up a STAD pencil extender from Jetpens last week and as my usual review style, I put it through it’s paces before I wrote a review. I’ll admit my first impression was not good. Looking at the package I was expecting some weight and this extender while chunky is very light weight. I tried stuffing a vintage FaberCatell Design 3800 4B into its grasp and the little white plastic cap didn’t like it, or the extender didn’t like it, whatever it was the pencil is now in hiding and I can’t find it. (Turns out it was just hiding lower in the pencil cup…) Every pencil I stuck in it’s jaws seemed…. Loose. I took a look at the back of the package. There were some diagrams on the back with all the writing in Japanese… Picture #3 shows some fingers touching the jaw. I thought maybe in that image the fingers are squishing the jaws to the pencil, so I tried it. Oh baby, what a difference. The extender went from loose to thighs of steel. It grips all my regular sized pencils, from my Palominos to Vintage FaberCastell Design 3800s to PrismaColor Col-erase with an eraser. 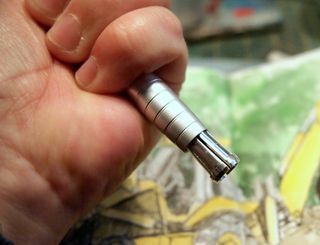 When you are done drawing or writing you can flip the pencil point into the extender and protect the point from breaking and you from being stabbed. WIN! 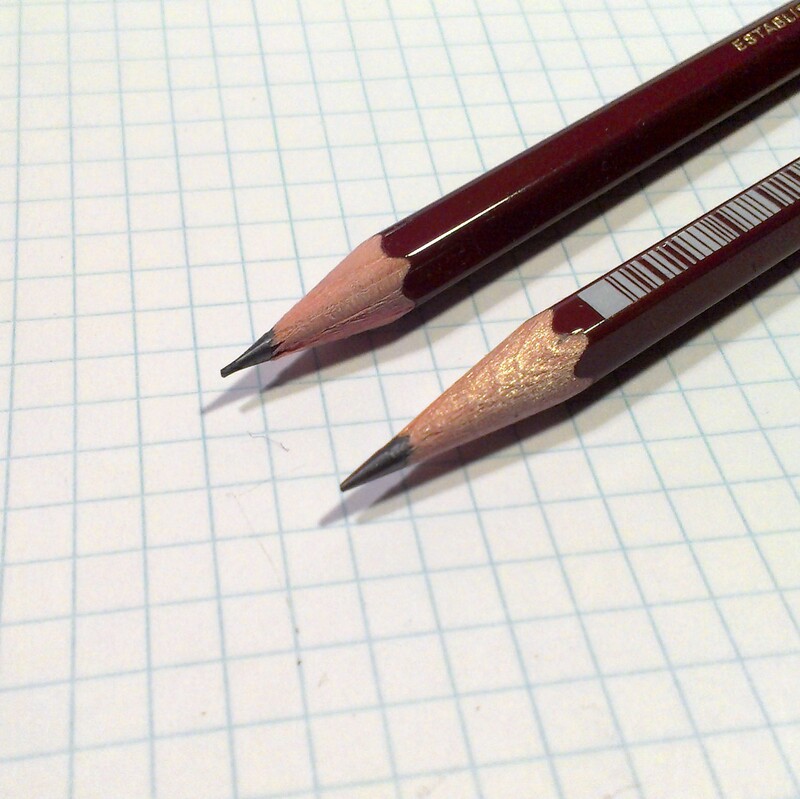 This holder, like others, allows you to use your pencil down to the last tiny nubbin. The smooth grooved barrel is comfortable to hold and use. It's diameter makes it seem as if you are writing with a nice mechanical pencil or pen. Fancy. 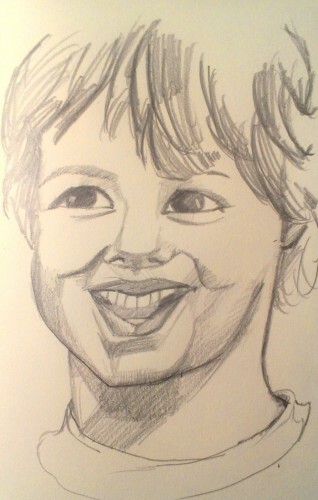 This entry was posted in Review and tagged extender, jetpens, one touch, pencil, review, stad on 20120614 by leslie. I purchased a 6 pack of Golden Mediums about a year ago and other than using the gloss gels I haven’t used them. The list price for 8 ounces is $13.49 and it comes in a tub. In the tub it is gray in color and looks much like cement. I used an old discount card to spread it on my binder’s board. It lays down a very thick and heavy layer. I found it pretty difficult to lay it down thin. As I was laying it down on the board I had moments where I didn’t think it would stick. It’s a very dry gritty material. It does stick. It helps to work slowly. Because it is so gritty I would recommend using an old brush or a metal palette knife to spread it. 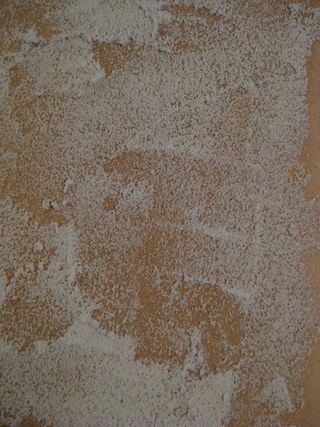 When dry it still retains that cement like look which could make a very cool texture in a journal. It retains its flexibility so it could be used on a journal page with no issue. 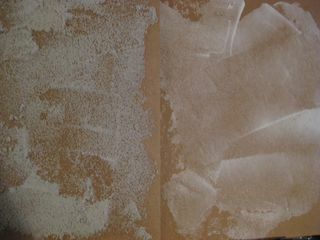 It can be used as a base much like gesso but keep in mind it’s very gritty and its surface is much like 60 grit sandpaper. It’s very rough. When coloring my pages it wore holes in the rags I was using to apply glaze and color. This is a very intense texture gel that can definitely make a statement when used on canvas or page. It took a full ounce to cover an 8.5×11 inch page completely. The deep crevasses and graininess of it is very neat. With color added it’s even more interesting. A quick comparison of the Golden Coarse and the Liquitex shows that the golden is muchmore coarse, the liquitex is more like 100 grit sandpaper where the golden is like 60 grit. The difference is noticable and visible. 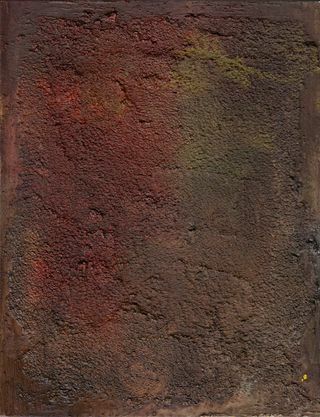 This entry was posted in Review and tagged art, coarse, gel, goalden, journal, pumice, review on 20110526 by leslie.